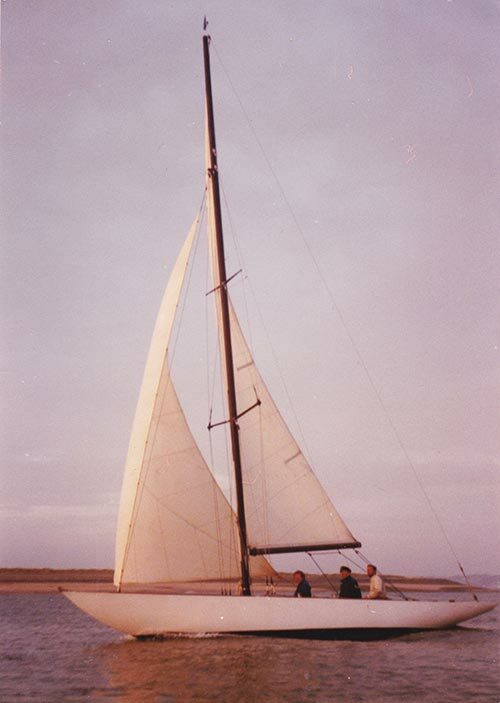 The Six Metre Kyria was designed by Charles E. Nicholso﻿﻿n and built by Camper & Nicholsons in Gosport, UK. But what exactly is a 'Six Metre' ? Six Metres are pure racing yachts which, rather confusingly, are not actually six metres in length! Their overall length varies from about 10 metres to almost 12 metres. All Six Metres are unique designs and as such their proportions vary slightly. They are designed to a measurement formula, a rating rule known as the International Rule, the first iteration of which was ratified by an international committee in 1907. There were two further iterations, the Second Rule (1920 - 1933) and the Third Rule (1933 - present day). For more information about the International Rule and about Six Metres click here or on 'Sixes' in the menu above. Kyria was built to the Third International Rule and was the last 6-Metre from Nicholson's drawing board. The Six Metre class was selected as one of the classes for yacht racing at the Olympics Games between 1908 and 1952. This included the London Olympic Games in 1948 (where the Olympic sailing event was hosted at Torbay). Kyria took part in the 1948 Olympic Trials, but was not selected. Facts and figures are all well and good, but they do a poor job of describing the essence of a metre boat. With their long overhangs and sleek lines, Six Metres have an aura about them which is difficult to describe in mere words. They have to be seen and experienced to be able to appreciate what they are all about. ​​Six Metres inspire a loyal following and there has been a great resurgence in the class in the last 30 years or so. Many of the older boats have been restored to pristine racing condition. A number of modern boats have also been designed and built within the same period. 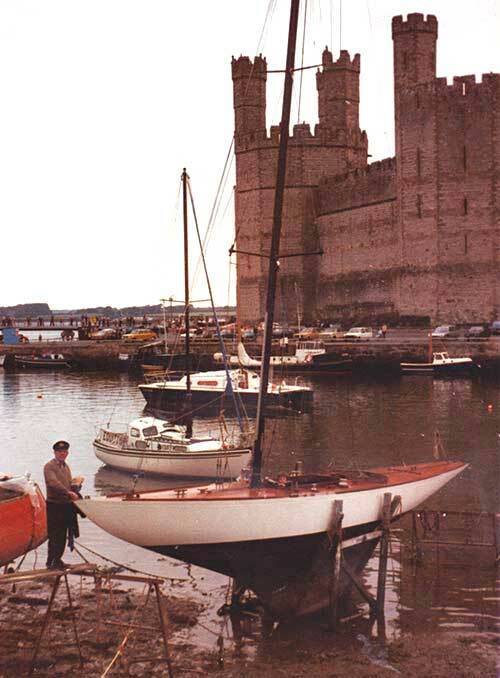 Kyria sailing in Caernarfon Bay, circa 1982. 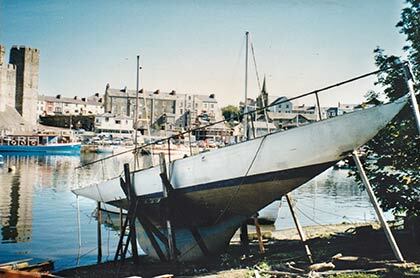 Boats built prior to 1965 are referred to as 'classics' and those built after 1965 are classed as 'moderns'. Both classics and moderns often race together. In light to moderate airs a well sailed classic in full racing trim can still be competitive against some of her modern sisters, which is a testament to the robust nature of the rule. The 'classic section' of the class is a major driver of this resurgence. This is perhaps suprising for a development class that has been at the forefront of innovation in yacht racing. It is no exaggeration to state that in recent years there has been more activity in the class than ever. In the 'Useful Links' section you will find links to some of the various Six Metre Associations, together with links to some of the latest championships and racing. Kyria has been in the ownership of my family for around 40 years. My grandfather bought her after she had been damaged in the yard where she was being stored. The boat next to her burnt to the ground, leaving one side of Kyria's hull badly charred. When my grandfather passed away my father inherited her and he later passed her on to me. For more about this story and about Kyria's history click here or on the 'History' tab under 'About Kyria' in the menu. In the photograph on the right my grandfather ​can be seen standing on the plank near Kyria's bow. If you have very keen eyes you might also be able to see my head popping up out of the crew cockpit! I was about 9 years old in this photo. I used to love hiding below deck in the narrow overhangs that nobody else could reach! It's not suprising that I fell in love with Kyria at a young age! For a fairly detailed summary of the work I undertook previously, during the first phase of the restoration, you can click here or on 'Restoration' in the menu. I am pleased to report that with more time on my hands I have now finally re-started Kyria's restoration in 2017. For ease of identification this will be called 'phase two', and I am determined to see it through to the end this time! As the restoration progresses I will be writing a series of blog articles detailing the work being undertaken. These can be found here or by clicking 'Blog' in the menu. There will also be a list of the most recent posts below.